Q3.How Can I install and register in EaseFab Video Converter Ultimate? Step 3: Then, copy and paste the registration code into it, then click the Register button to go ahead. Meanwhile, please make sure that the Internet connection is fine while you register EaseFab Video Converter. 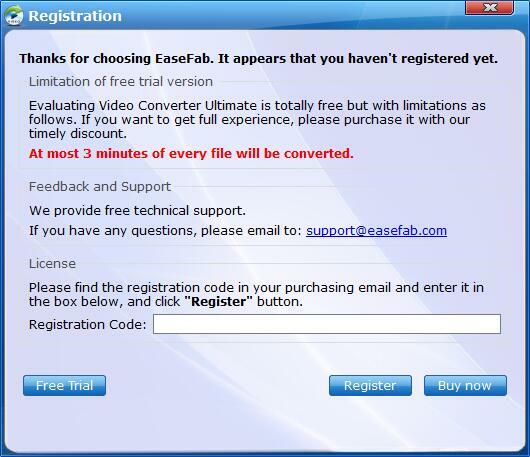 Once EaseFab Video Converter Ultimate is registered successfully, you'll see a pop-up registration successful page. Tips: Please ensure there's no trailing blank when entering your licensed E-mail and registration code. Q5.What can I do if my EaseFab Video Converter Ultimate fails to update? Step 2: In case above method is not working, you could go to our website to and press Free download. 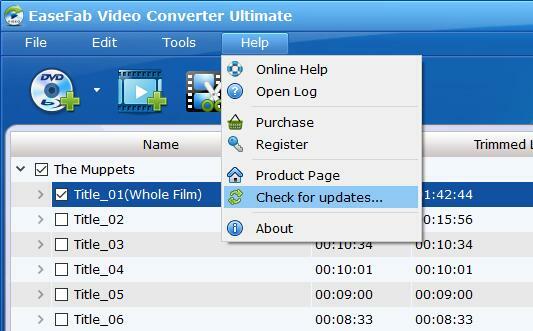 Or you could click the link below to upgrade EaseFab Video Converter Ultimate directly. · Make sure you are using the latest version of EaseFab Video Converter Ultimate. 2) If the case happens to some DVDs only, it is maybe the encryption issue. We suggest you contact us with detailed information, including Blu-ray or DVD name, the region code, publisher and Amazon link. Q8.How to Speed Up Video/Audio Conversion? Q8.Can EaseFab Video Converter Ultimate remove region codes from Blu-ray or DVD Discs? Of course Yes! Acting as all-region Blu-ray DVD ripper software, EaseFab Video Converter Ultimate can remove region code restriction upon Blu-ray/DVD discs. In other words, Blu-ray disc of region A/B/C and DVD disc from region 0 to 6 can be easily ripped and converted with EaseFab Video Converter Ultimate. For more questions, you can go to Video Converter Ultimate Help Center to find your answer. If you still can't find your needed question, please contact us to get your answer.